What a perfect time of the year to photograph in an apple orchard. We chose Cook’s Apple Orchard in Fort Wayne, IN for the location of Madison’s family portrait shoot. I had visited this orchard during a field trip with my son’s class and the owner was very welcoming and the orchard was beautiful. Madison has been one of my most loyal clients! This loyalty has allowed me to watch little Blake grow from a newborn into a toddling 13 month old! 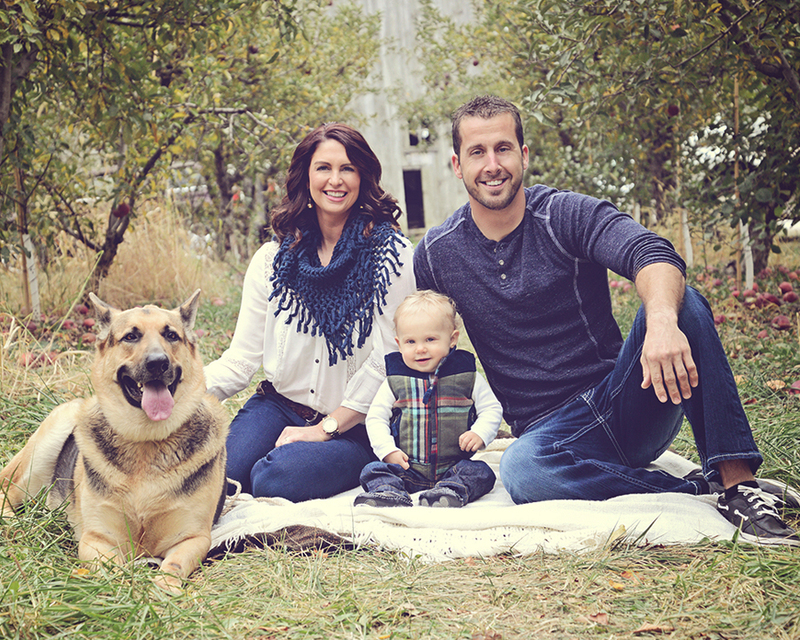 Oh, and I can’t forget about Charlie (the dog), he grows fonder of me every time we do portraits:) These family orchard pictures are absolutely stunning! You can almost smell the crisp fall air when looking at the pictures. I also love their outfit choice, the hints of red in Blake’s vest are complimented perfectly by the apples. My Radio Flyer was even able to make an appearance in Blake’s individual portraits. Here are just a couple beautiful pictures, to view the entire session click here. Need an updated family portrait contact me today.